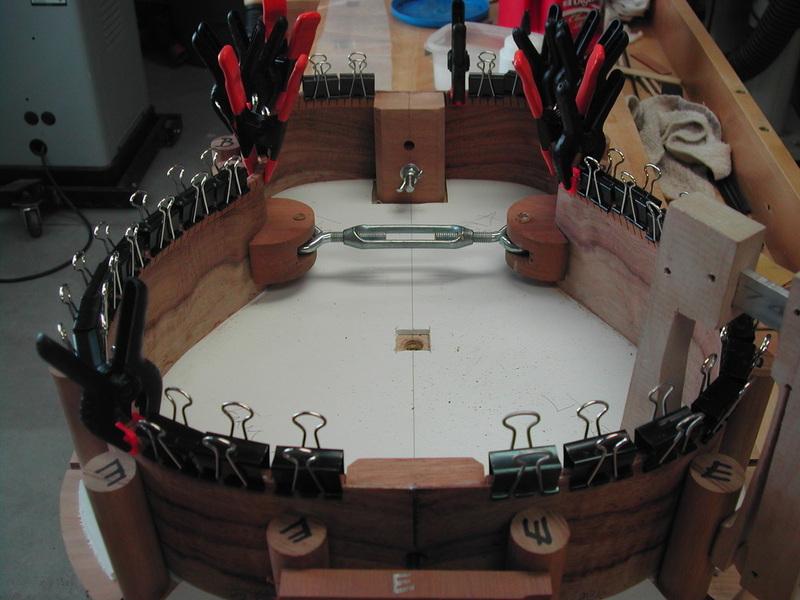 I have started a build for my good friend Ron V. who lives in the Seattle area. 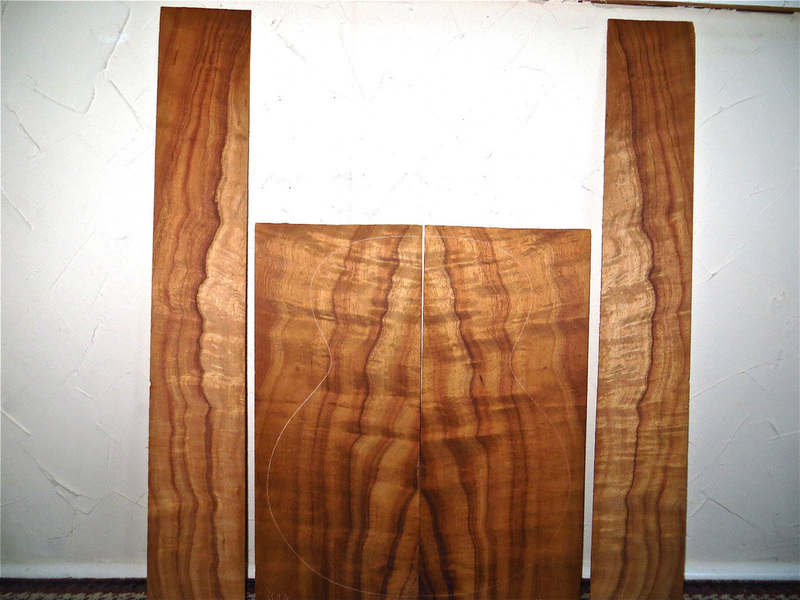 He has chosen a stunning set of Koa that we found from one of my suppliers. 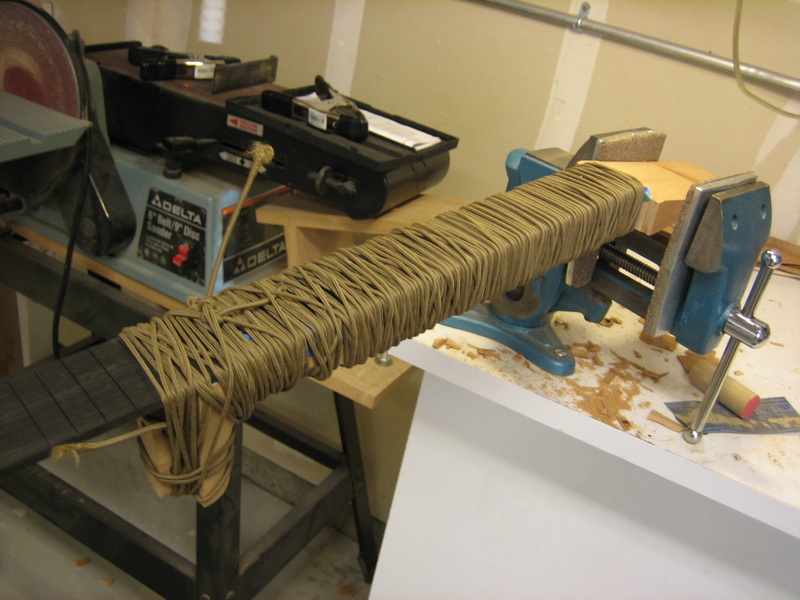 Pictured below. 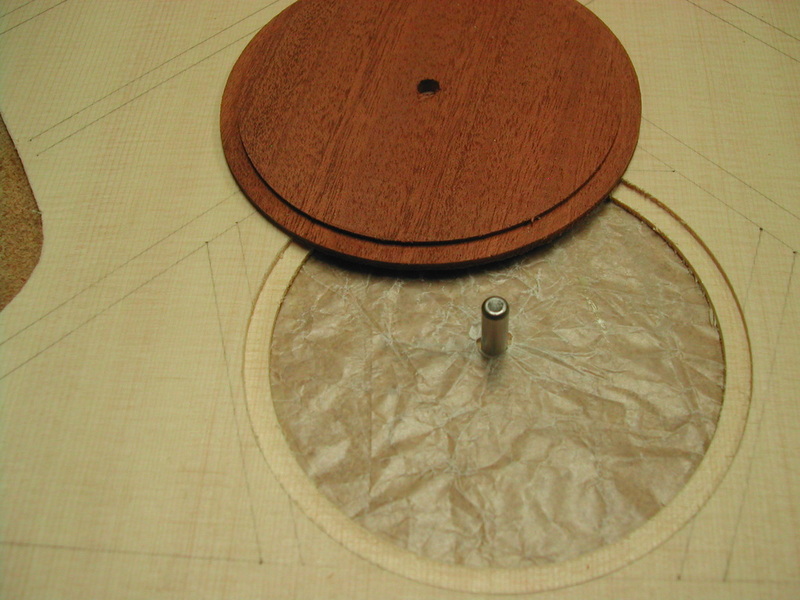 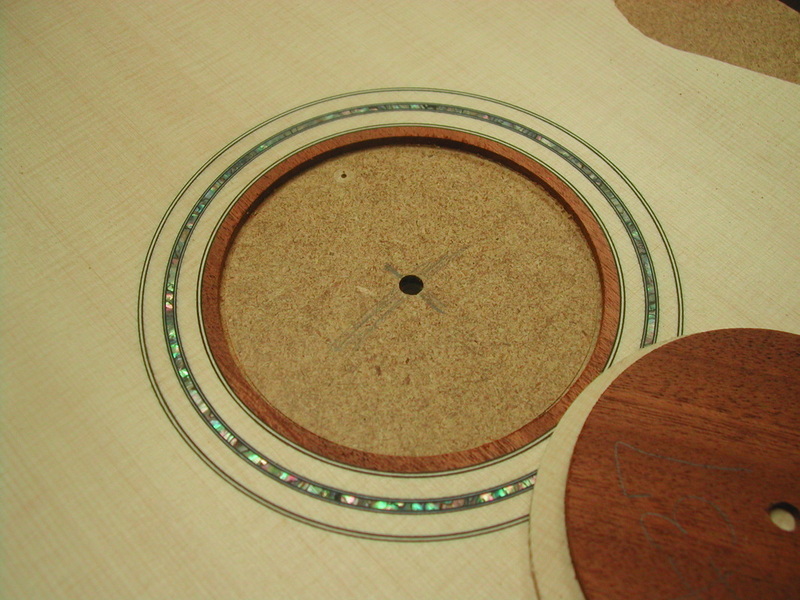 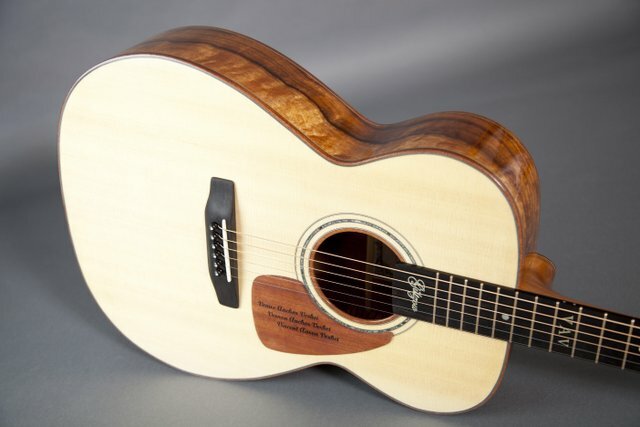 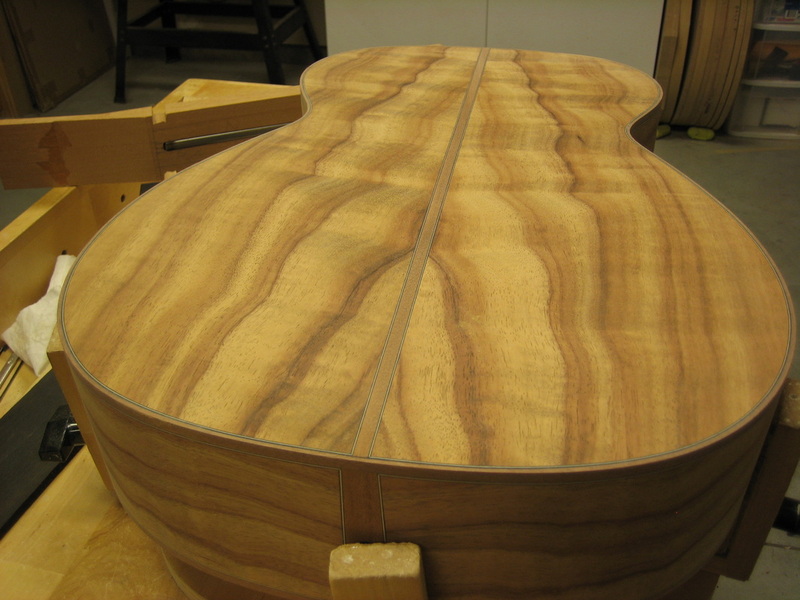 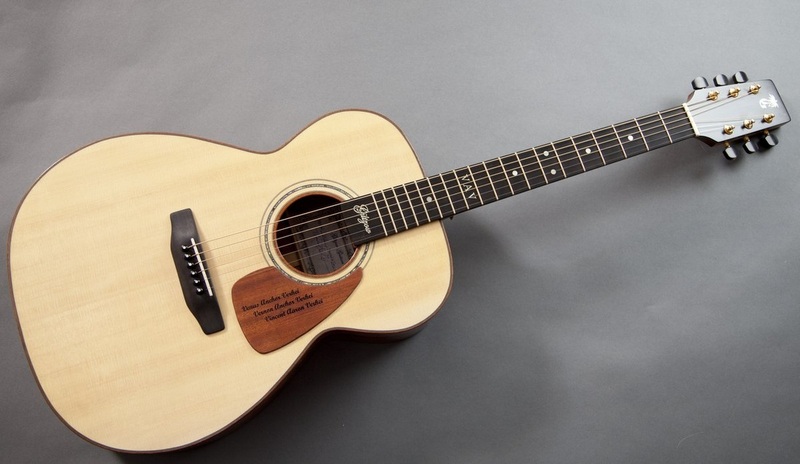 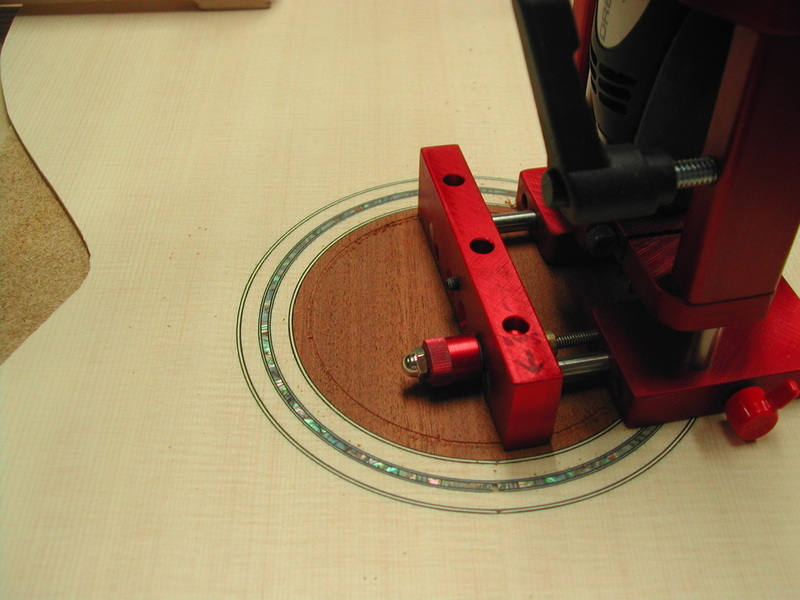 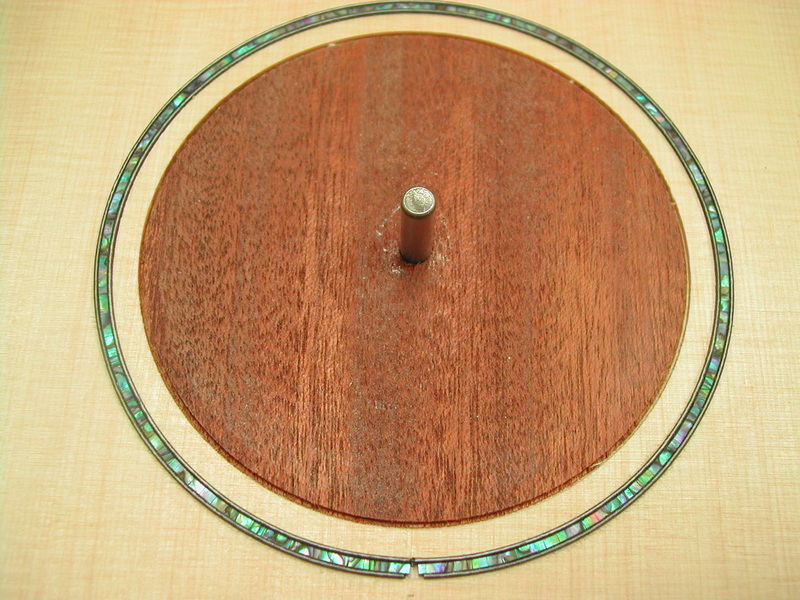 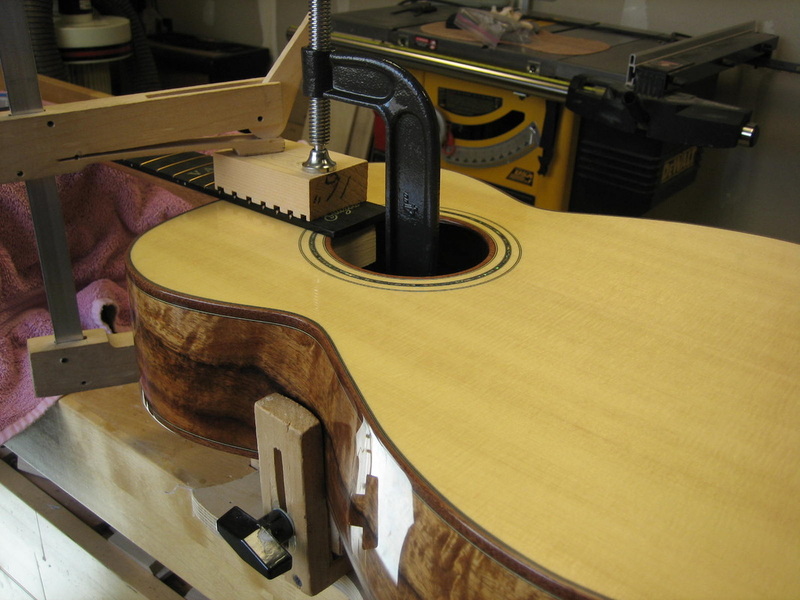 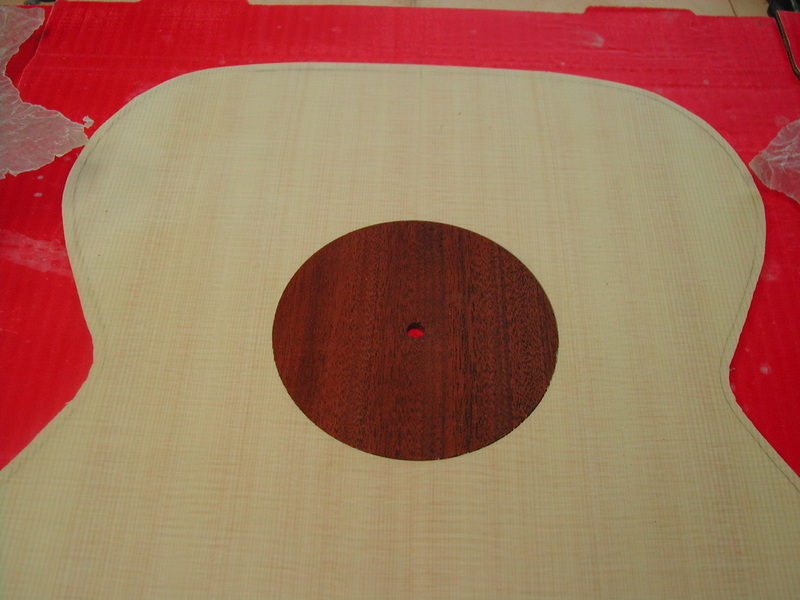 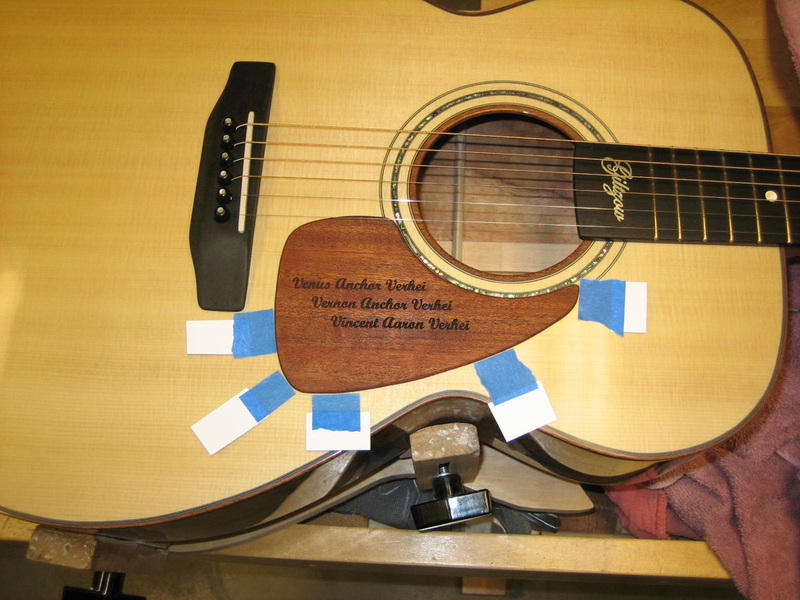 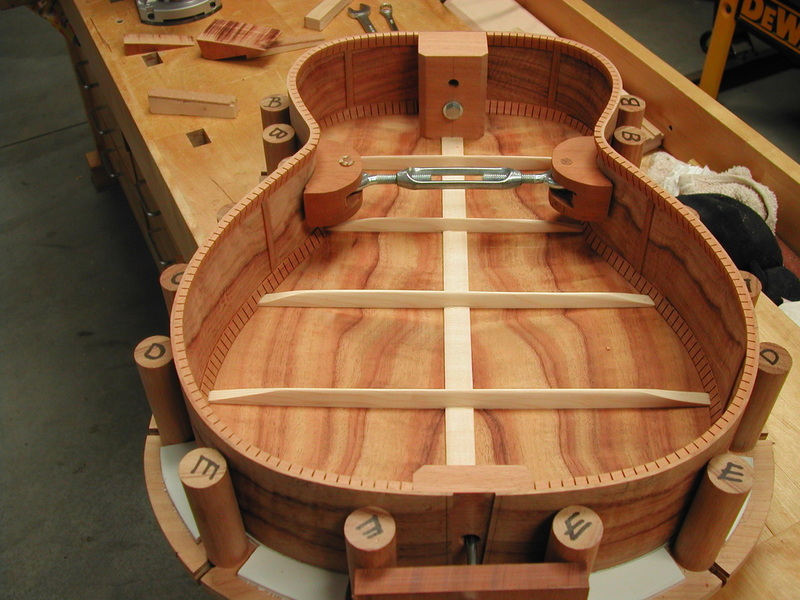 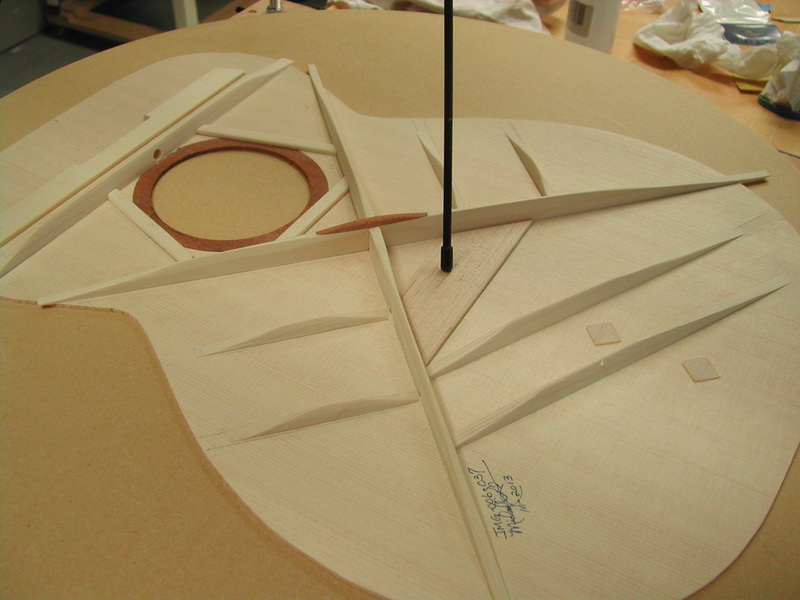 The guitar will be an OM size with Master Grade Lutz Spruce sound board. 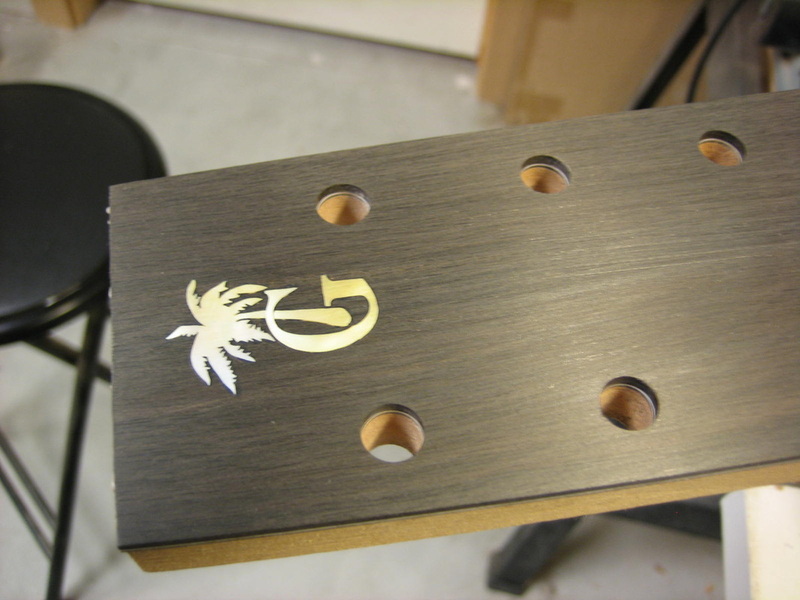 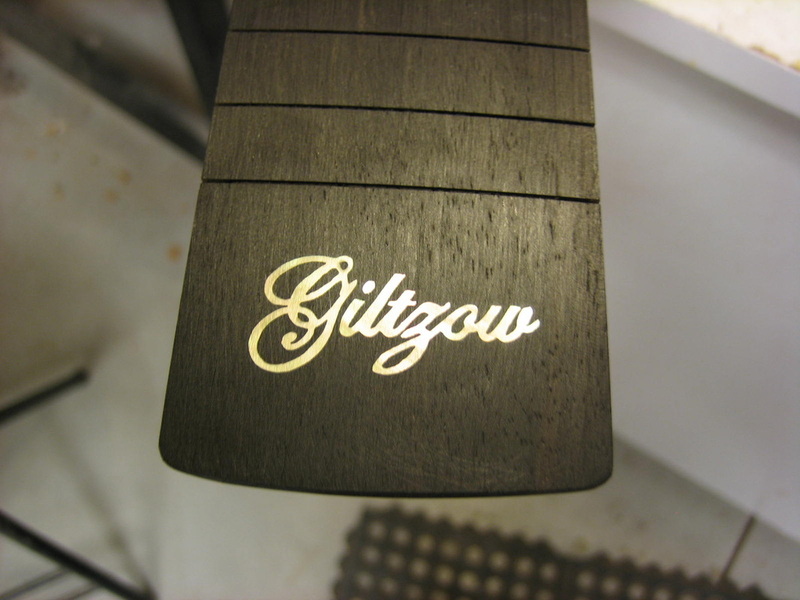 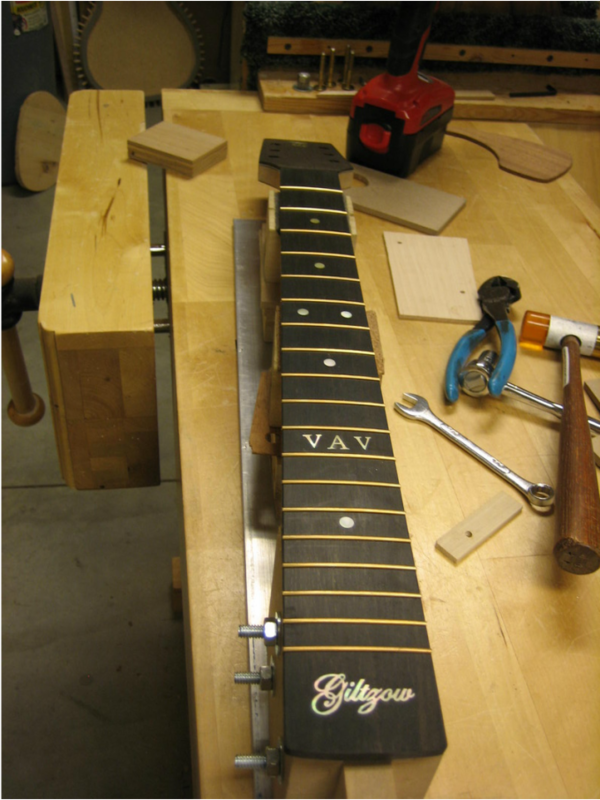 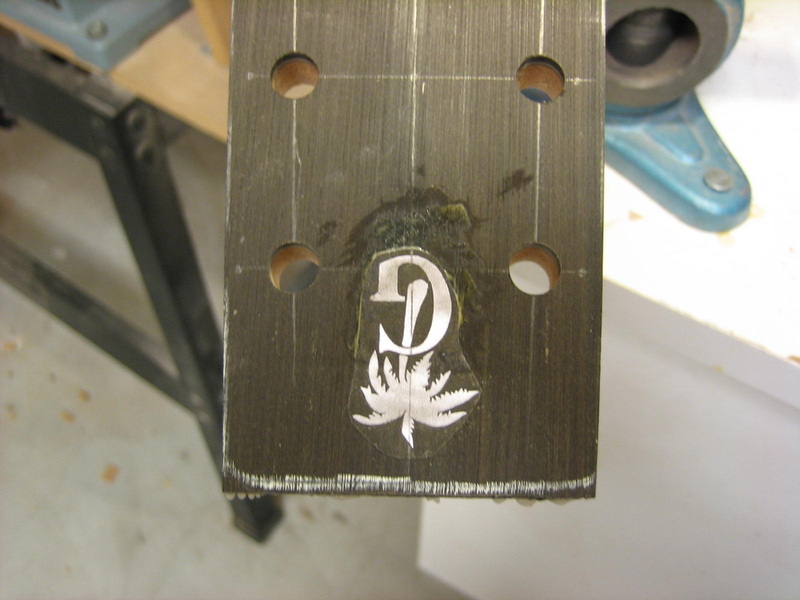 Finger board, bridge and headplate will be Ebony. 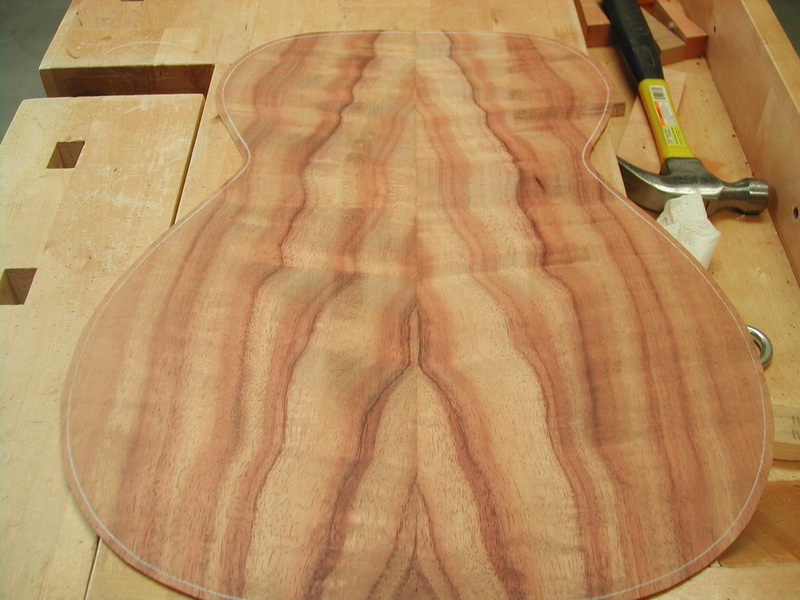 The neck will be South American Mahogany. 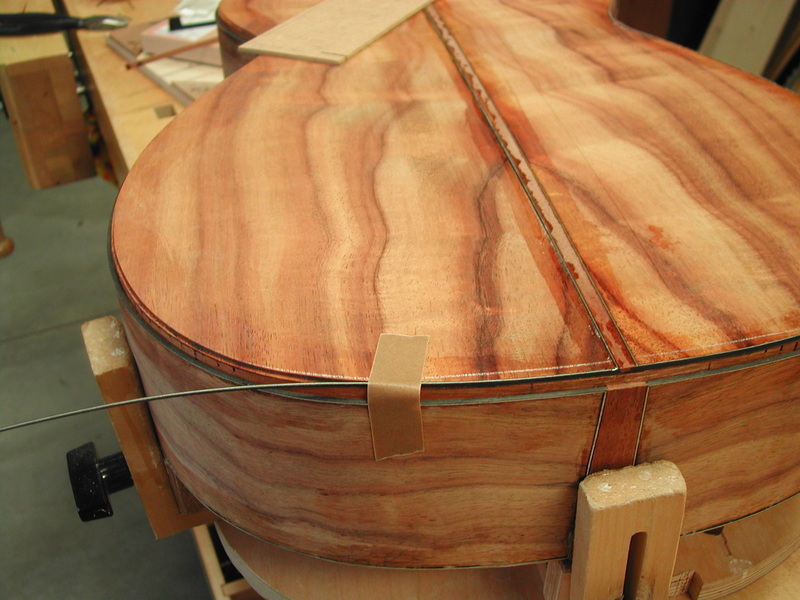 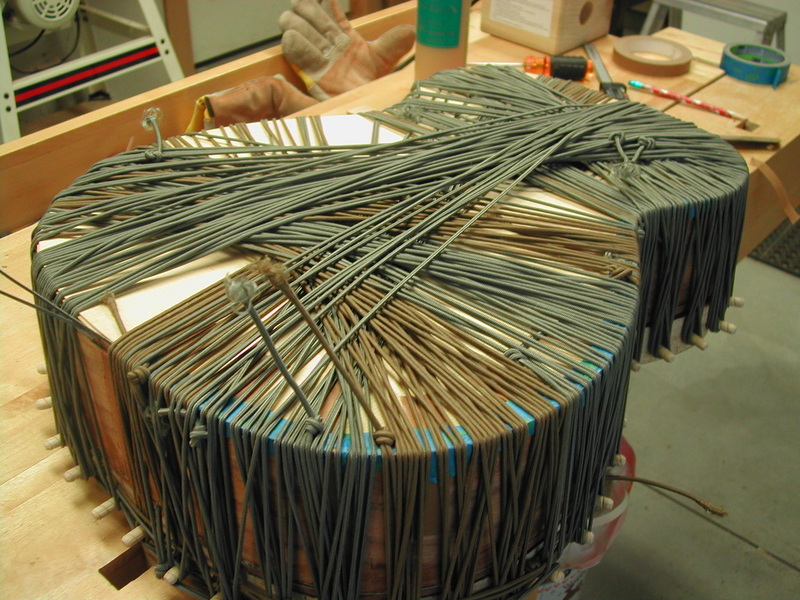 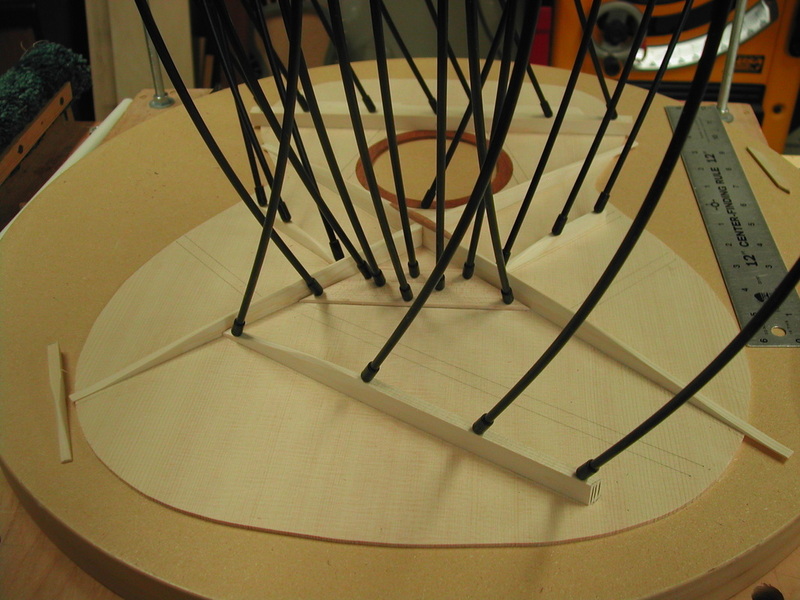 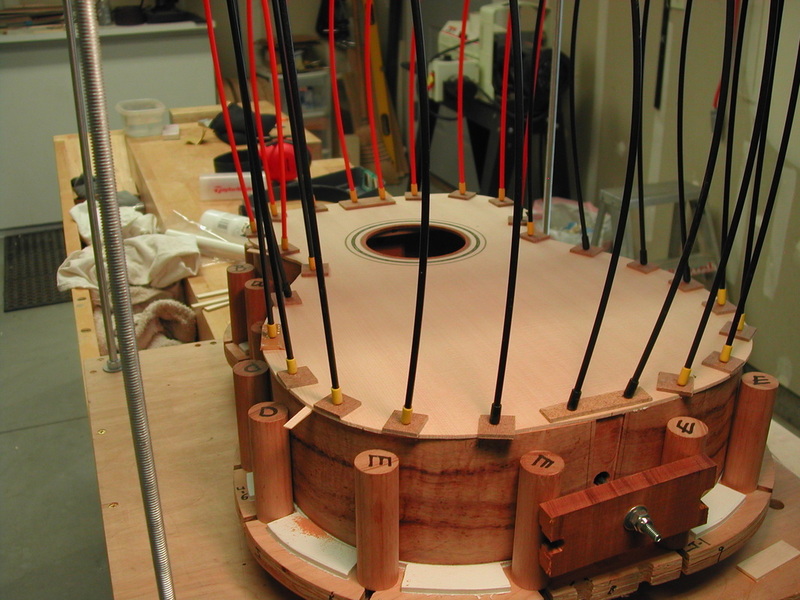 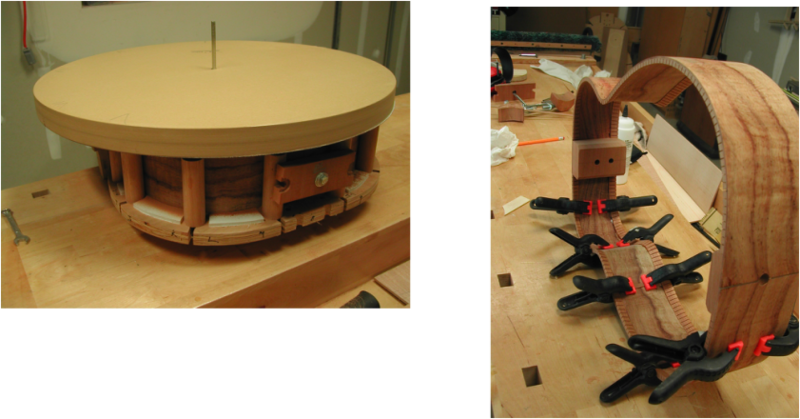 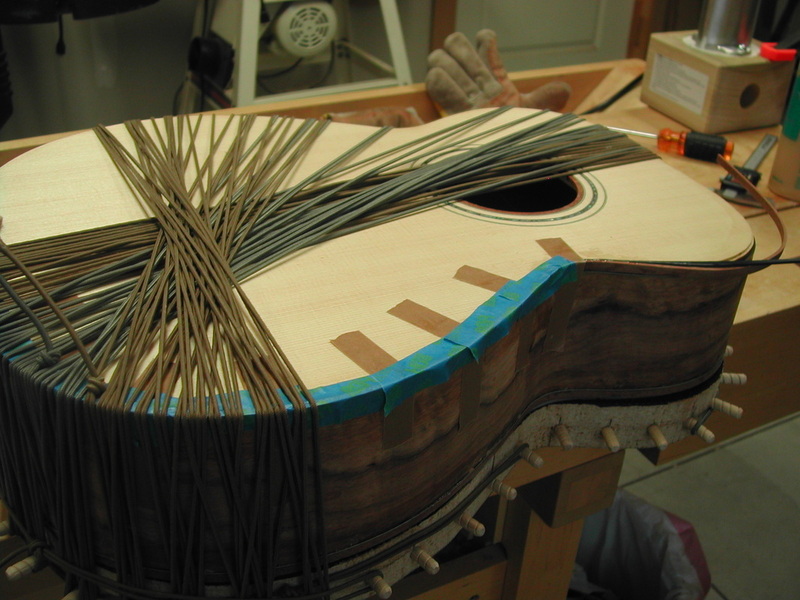 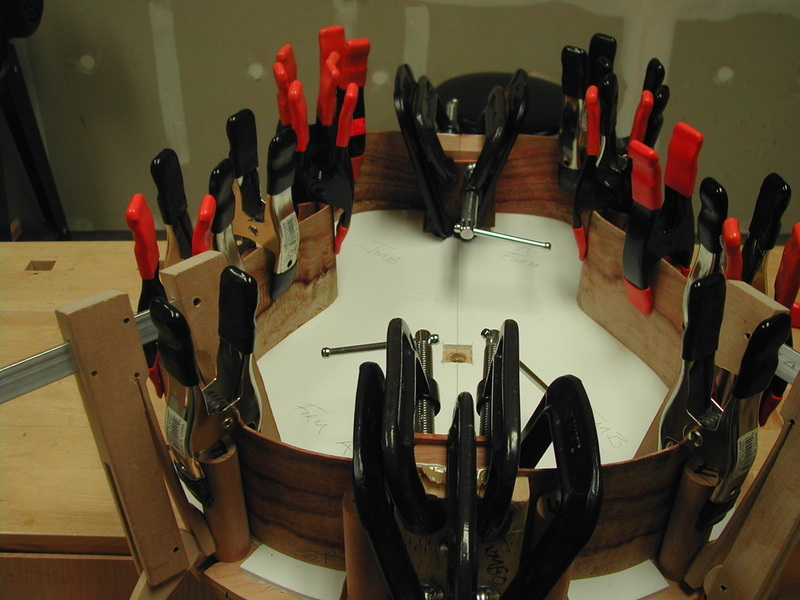 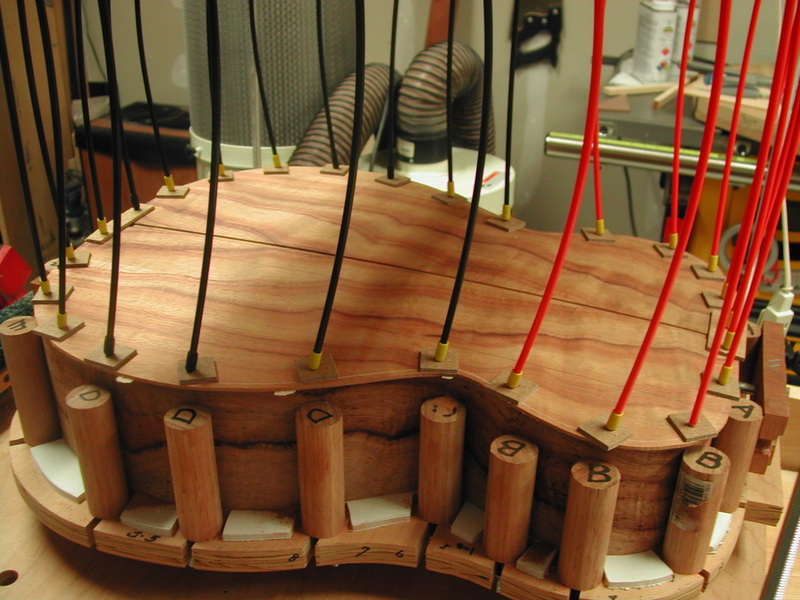 In the picture below the binding and top purfling is being glued. 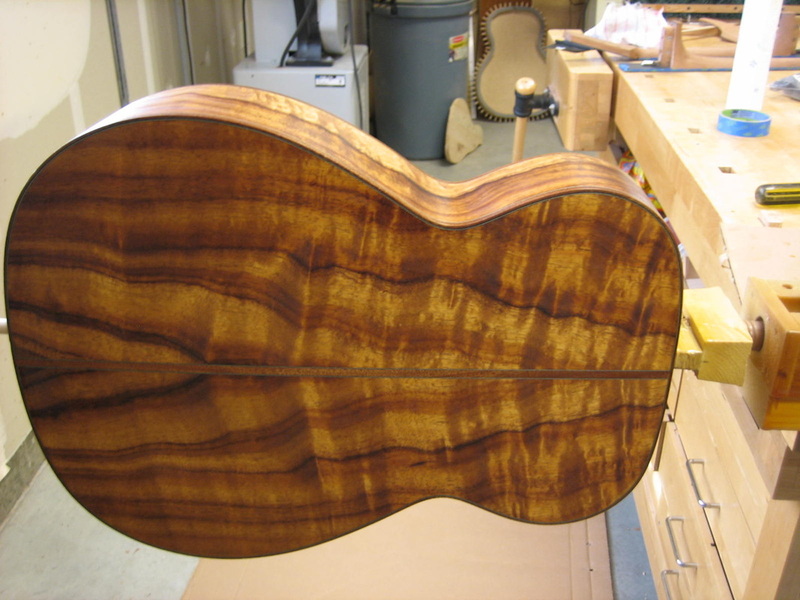 Usually do not get a picture of this as I am working fast to keep all the items in register and trying to beat the glue open time. 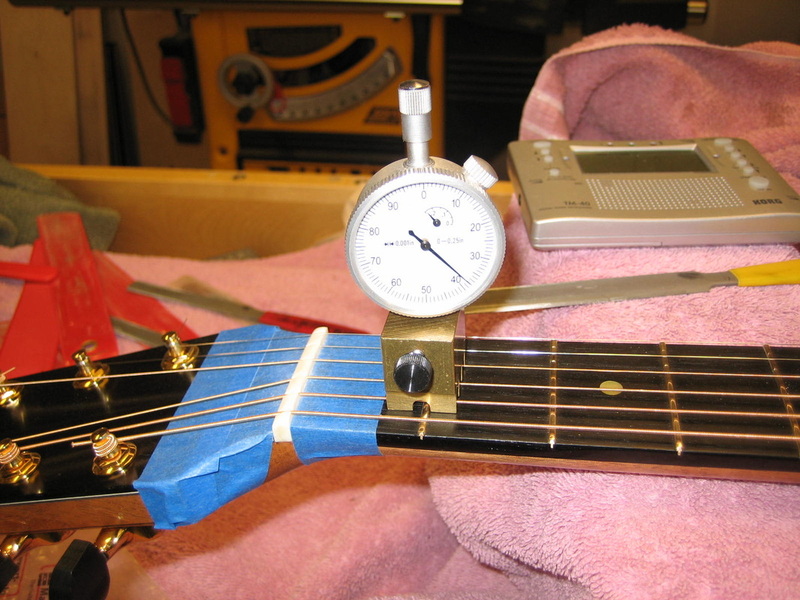 I usually have glue all over my hands as well, so that picking up the camera is not a real good idea. 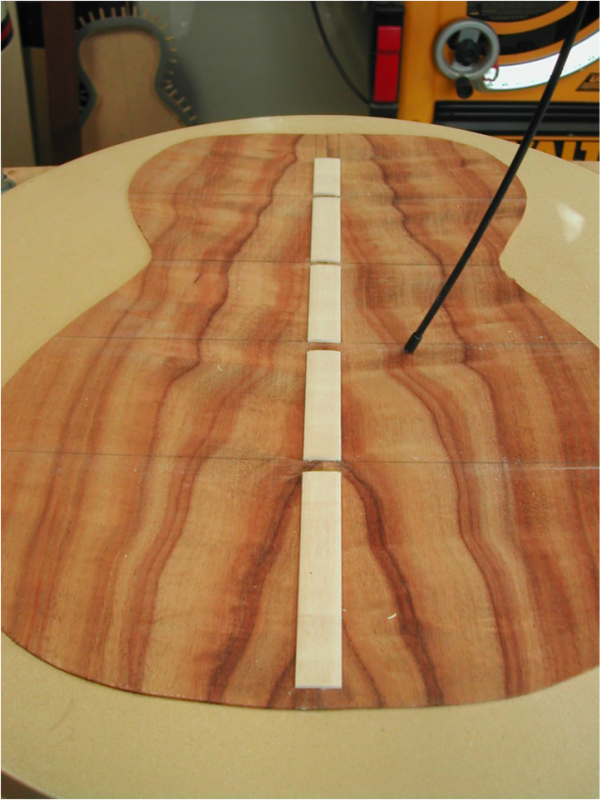 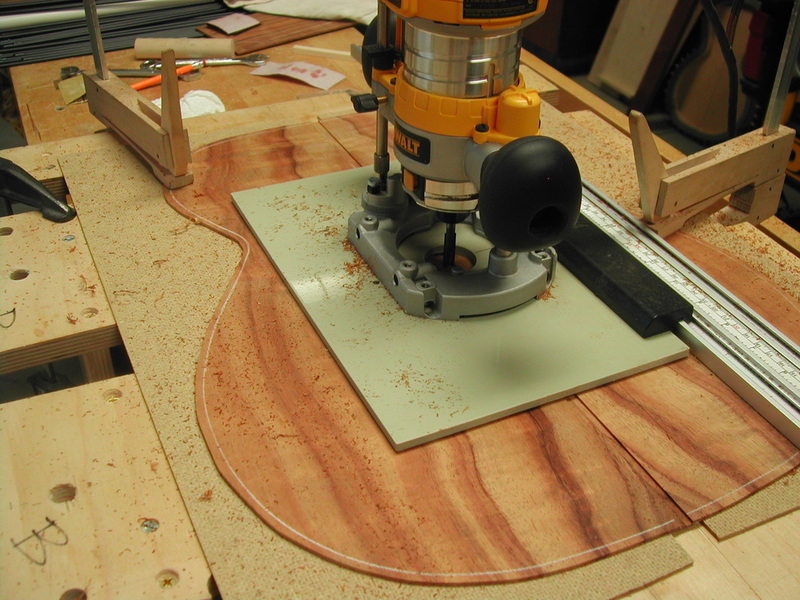 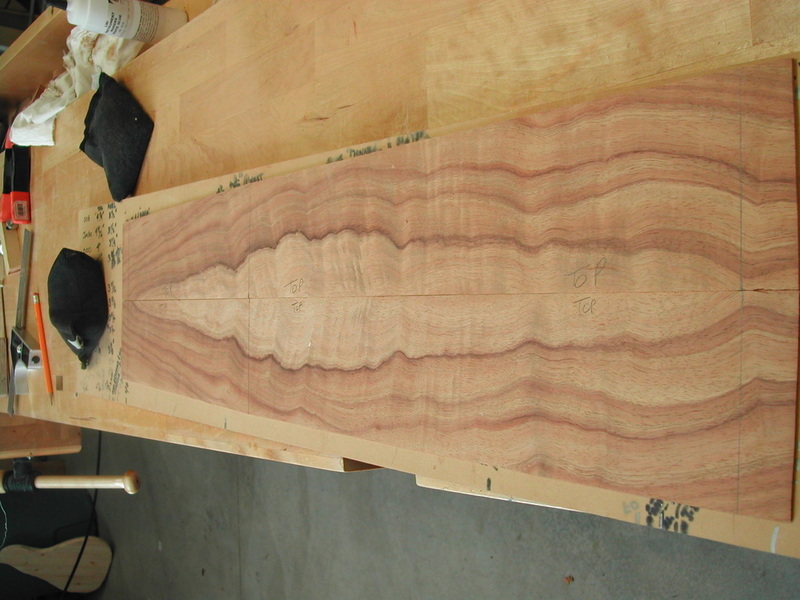 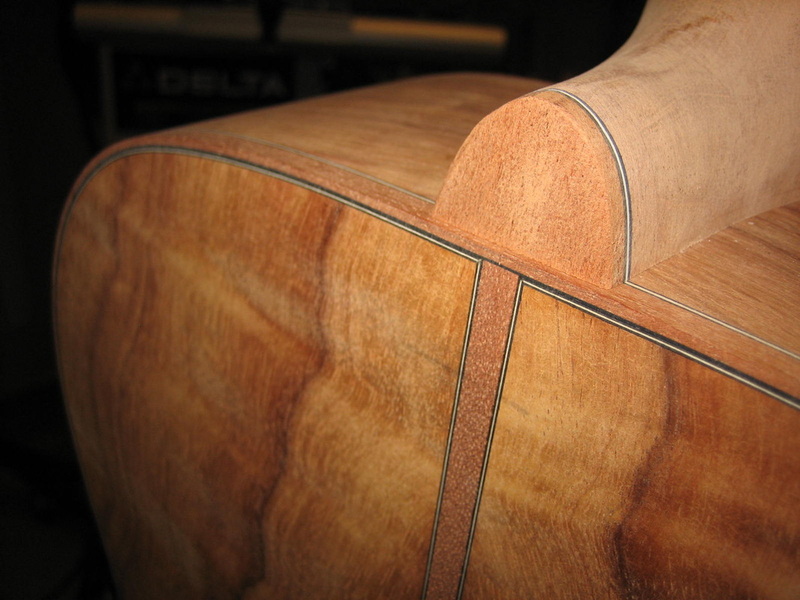 The Neck - The neck starts out as a 1" X 3" X 30" piece of South American Mahogany. 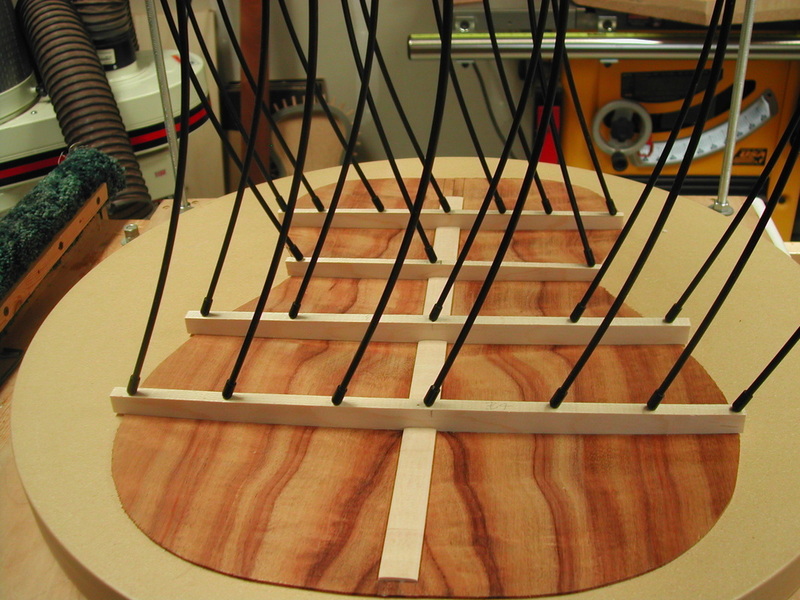 After truing up the Mahogany board I cut & glue a 15 degree splice for the peg head and stack piece of the board for the heel. 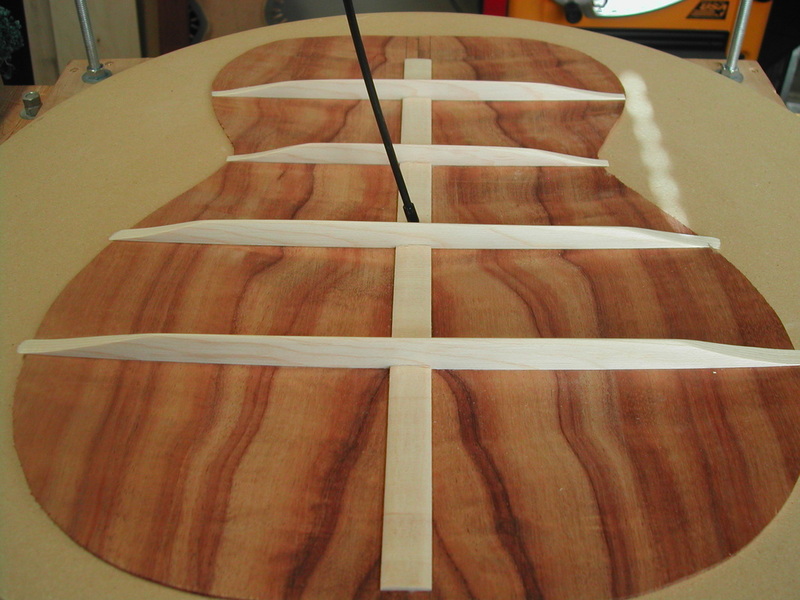 Now starts the process of getting the neck and body set up at the correct neck angle, neck centered with the body center line and heel cheeks flush with the body sides. 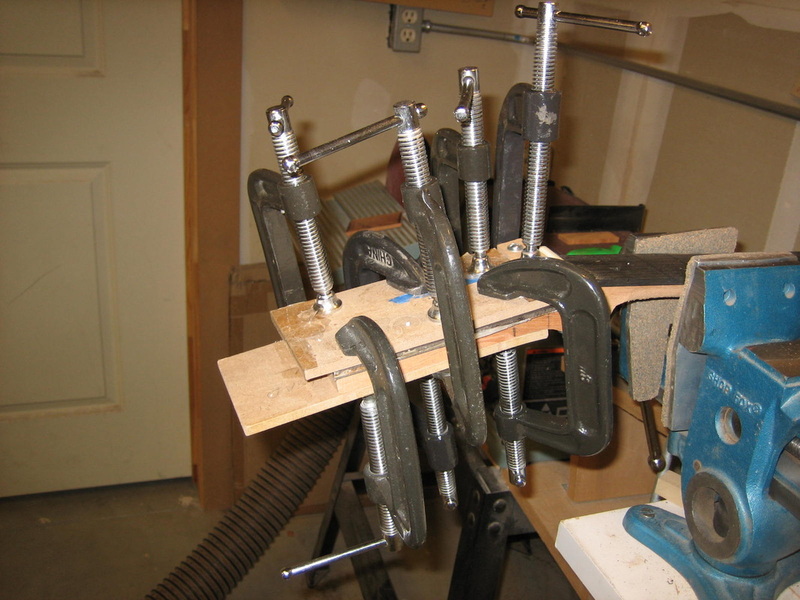 This is a time consuming operation and can be quite frustrating as a change to anyone of the 3 alignments can cause a change to the other 2. 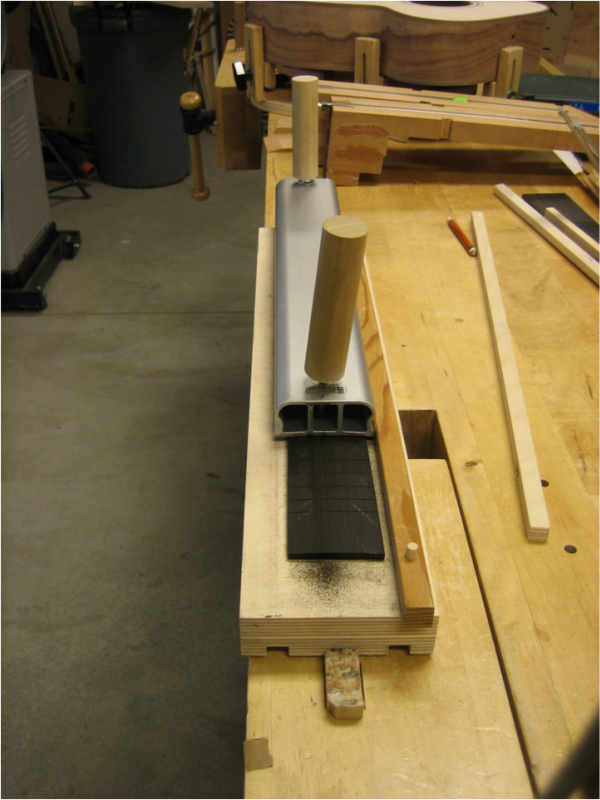 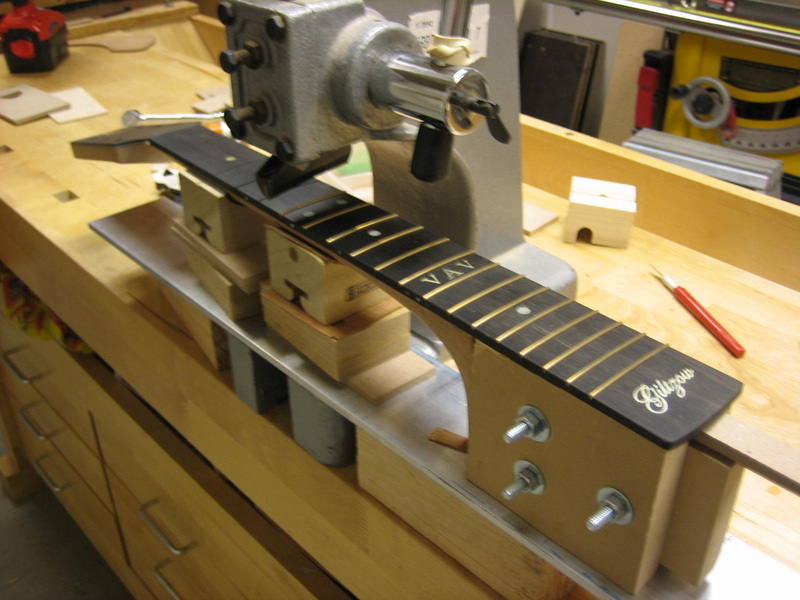 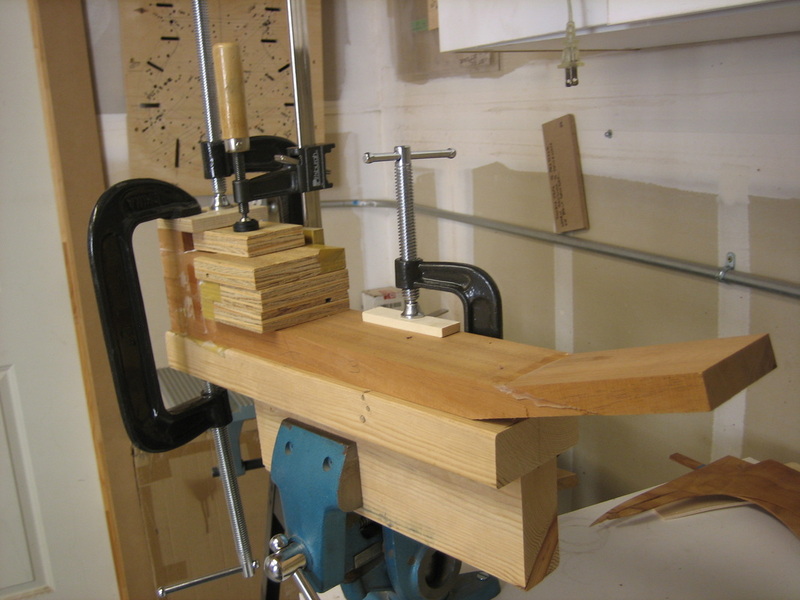 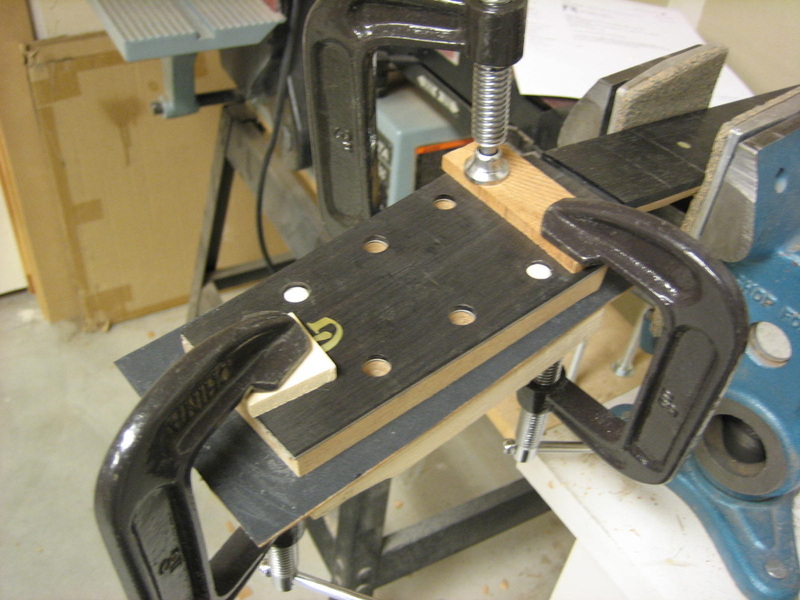 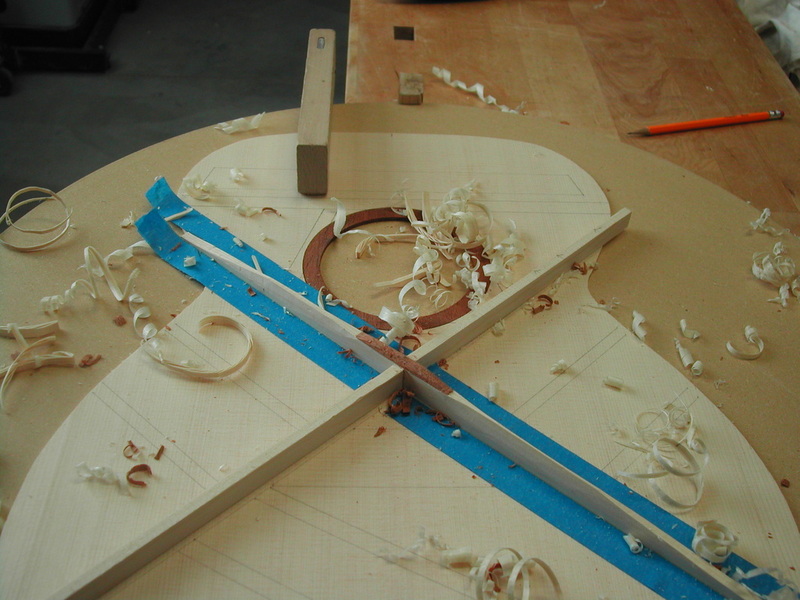 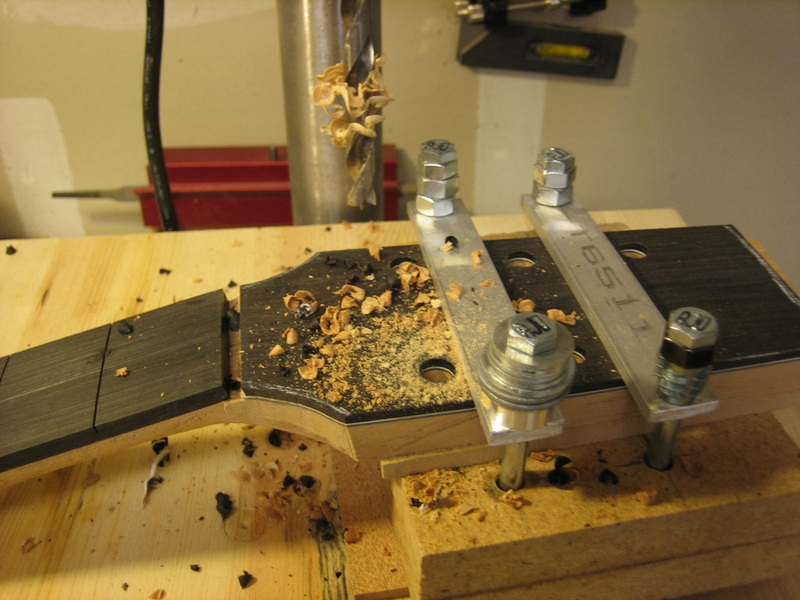 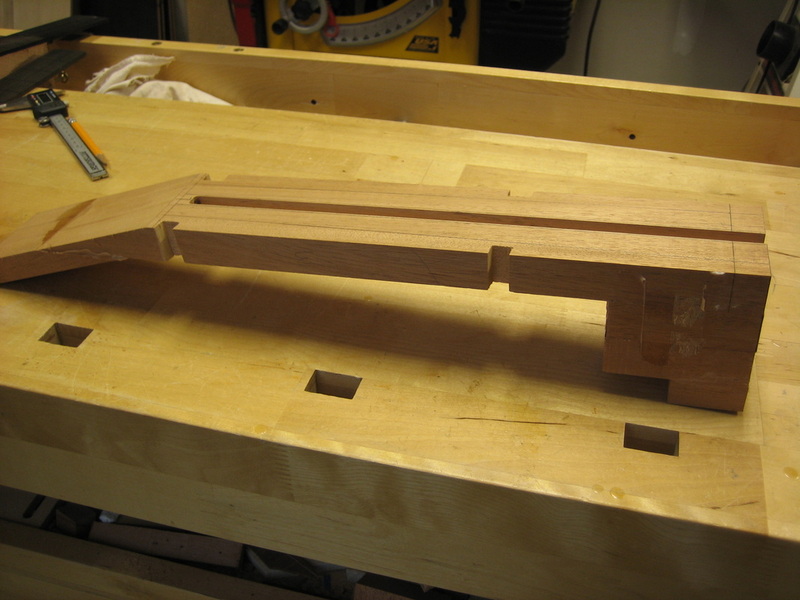 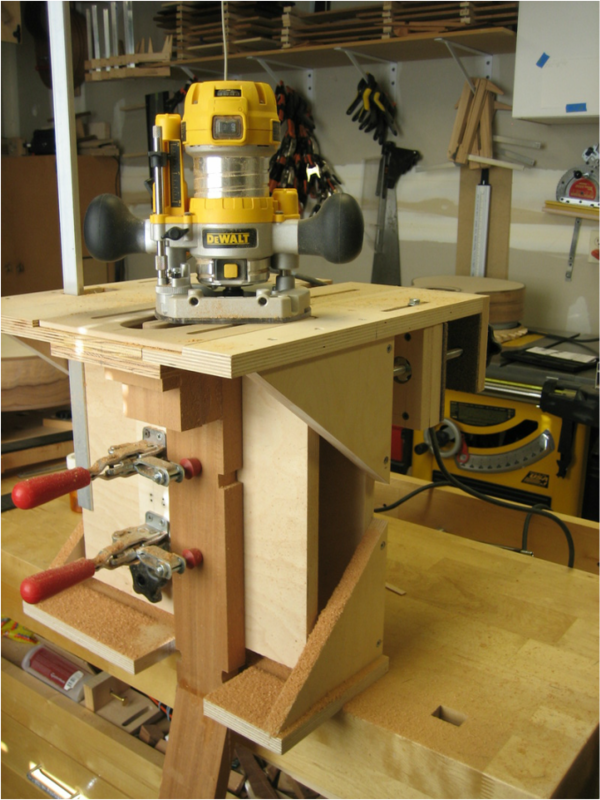 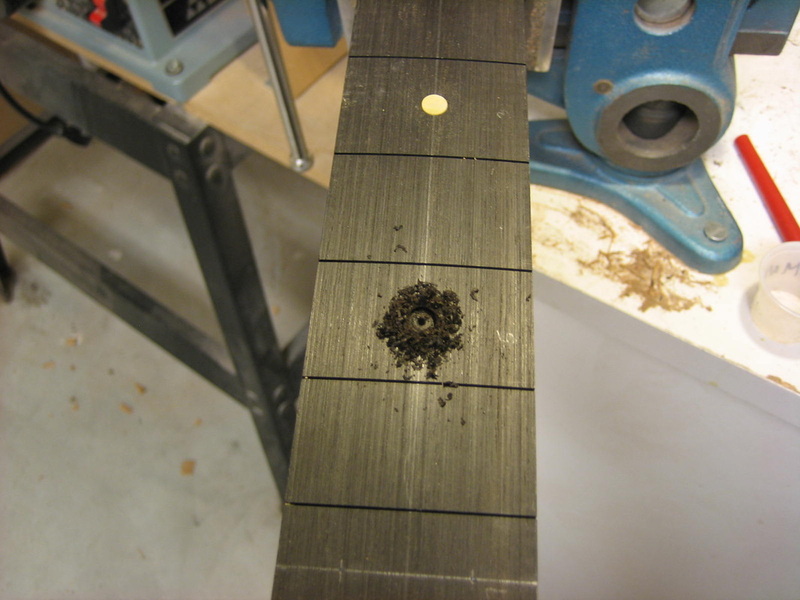 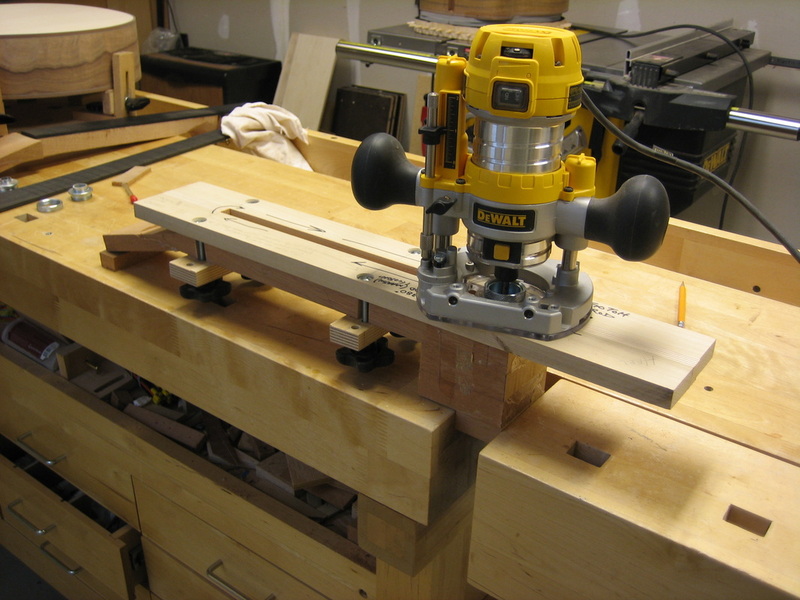 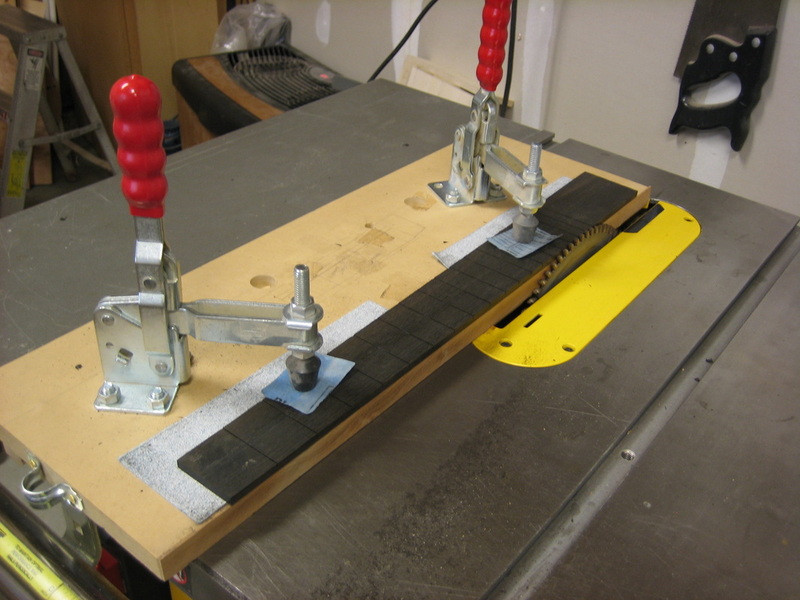 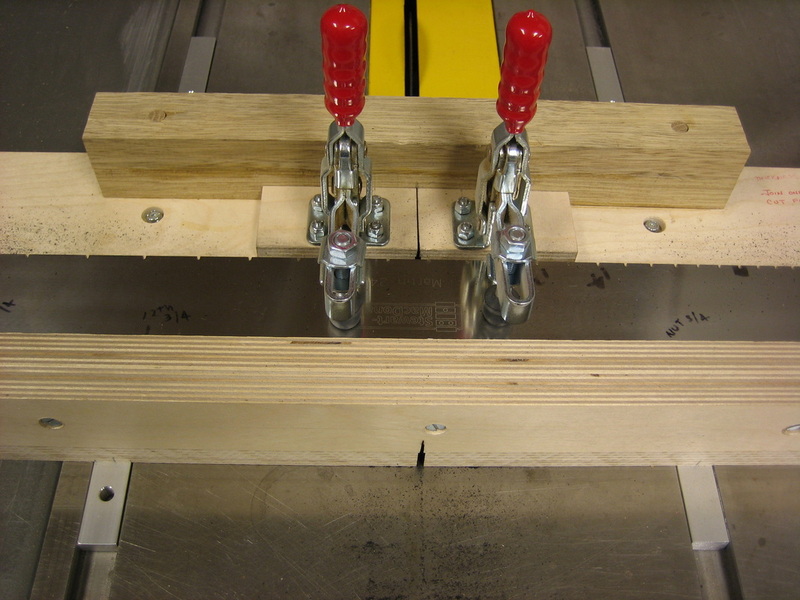 I am using the jig, pictured below, to cut the tenon on the neck. 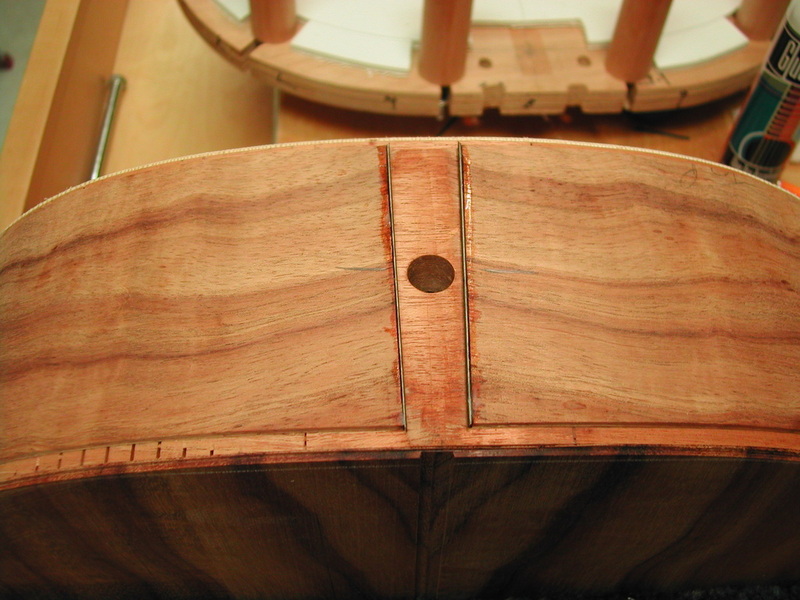 The other side of the jig is used to cut a mortise in the body. 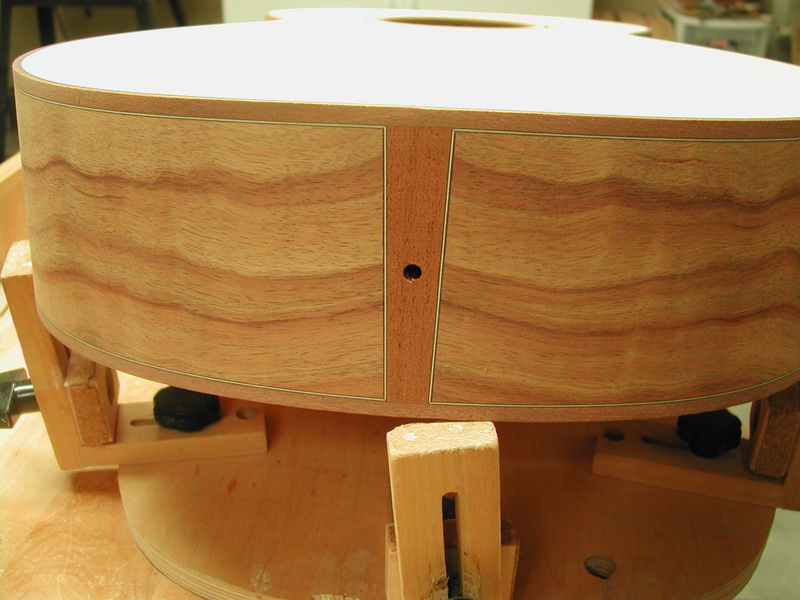 The last step before spraying finish on the guitar sound box is to fill the pores. 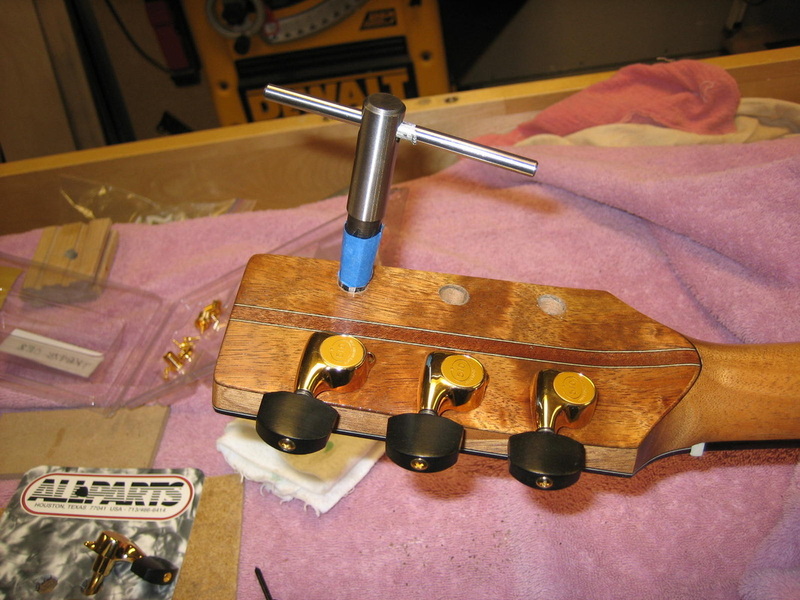 I use an epoxy finishing resin to fill the pores. 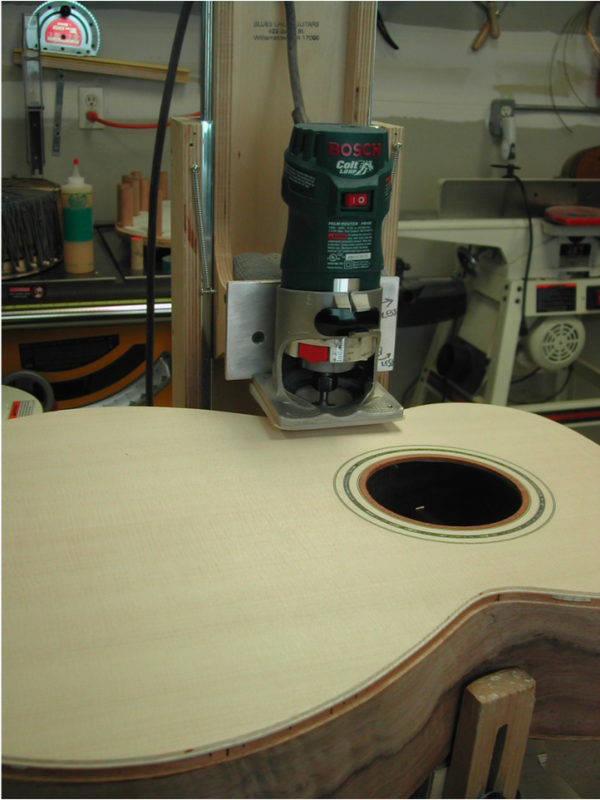 I heat the box with a heat gun and work the epoxy in with a flexible credit card. 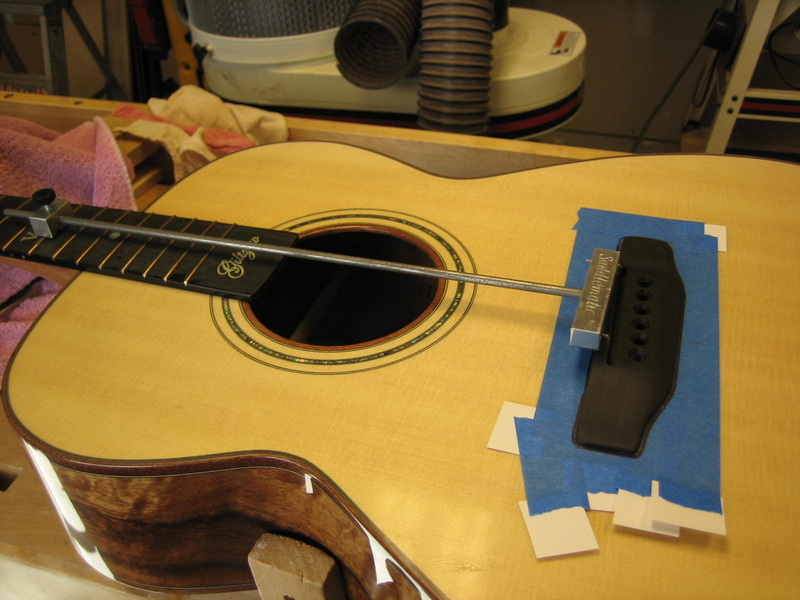 Sand it down after it cures over night and then do it again. 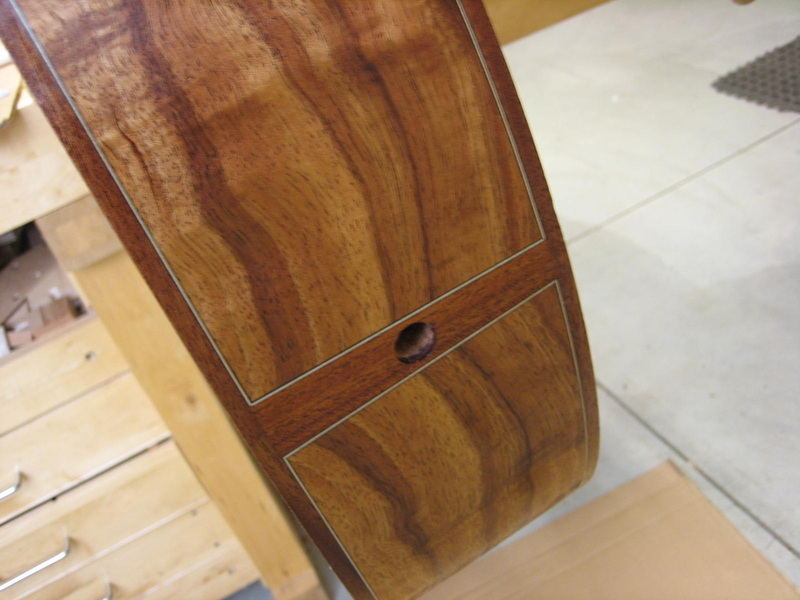 Usually 3 coats of epoxy does it. 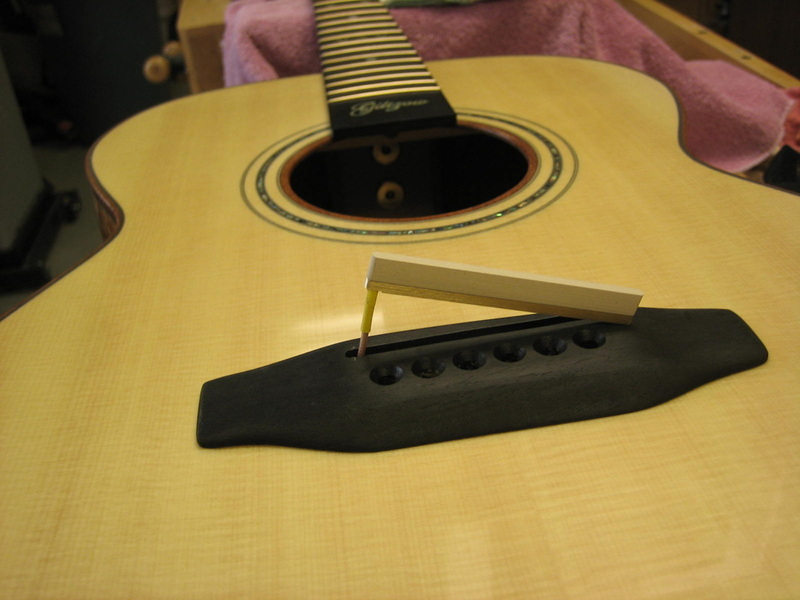 Very little epoxy is left - just a very thin coat. 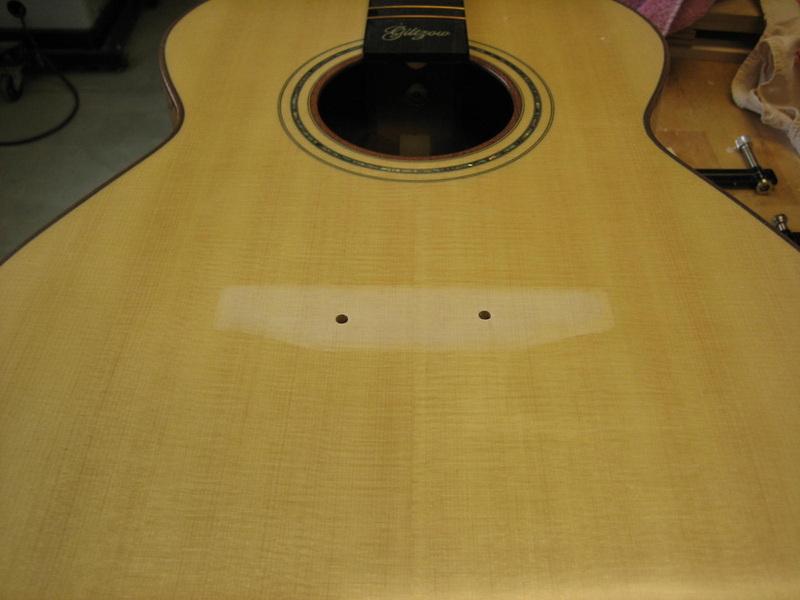 The epoxy fills the pores but also gives a good base for the spray finish to adhere to. 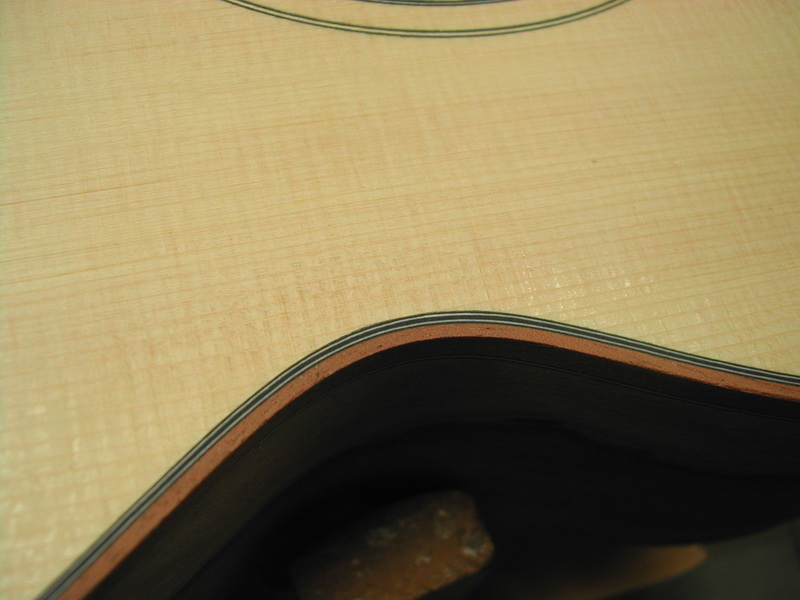 The sound board does not get epoxied as it does not have large pores to fill. 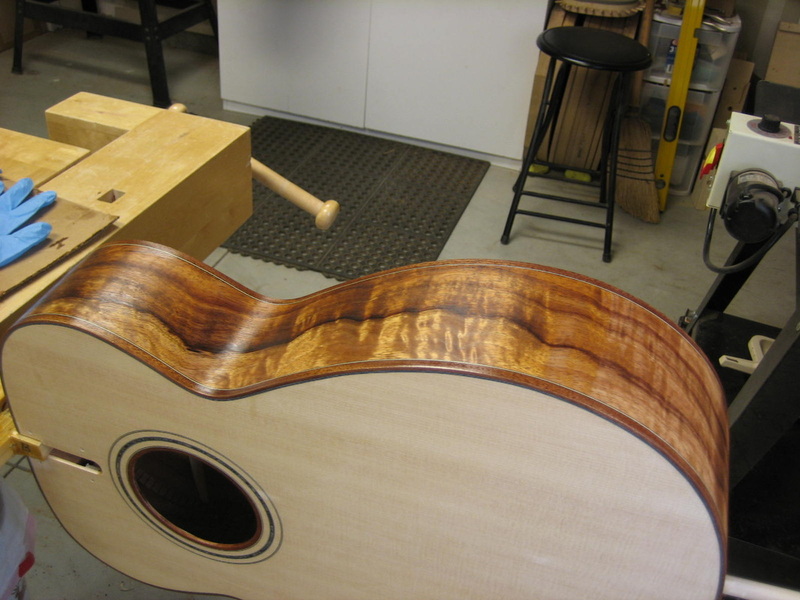 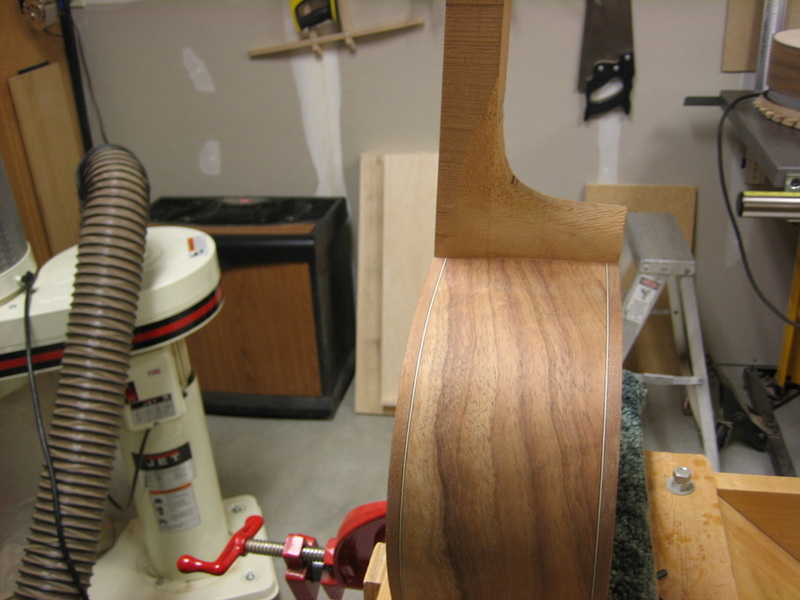 The neck is filled with a traditional pore filler and will be finished with 4 to 6 coats of Tru-Oil. 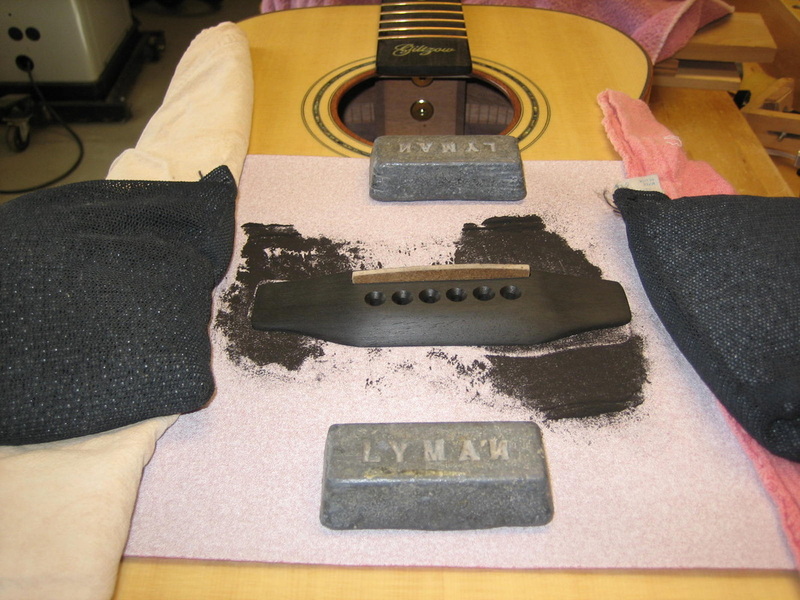 The epoxy darkens the color of the sound box and gives us an idea of what the finished guitar will look like after spraying and buffing. 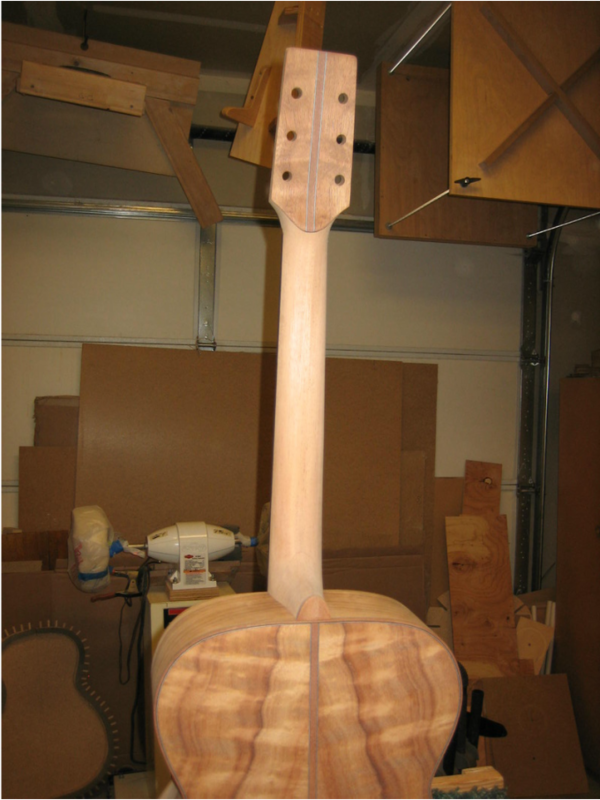 Now I am waiting the 3 weeks before I can sand and buff the finish on the body. 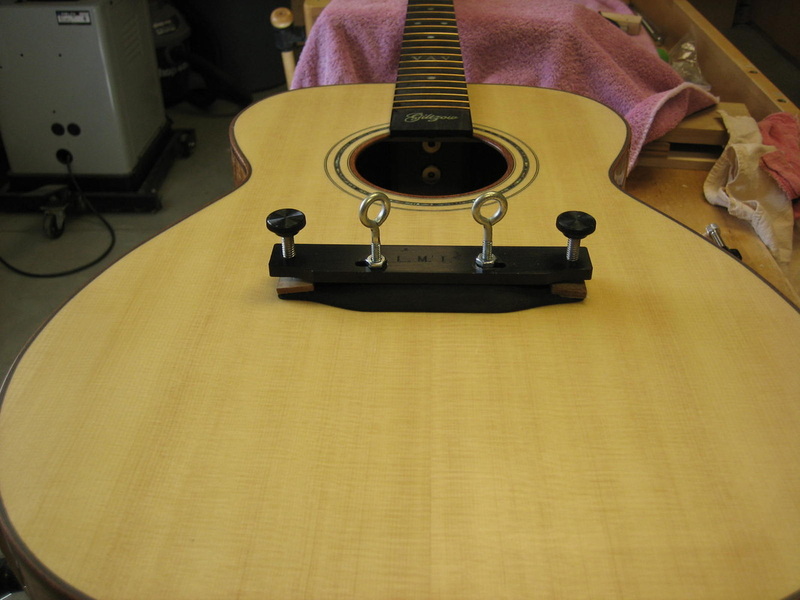 No guarantee that I won't sand through the finish and if I do that, then I will spray over again and then wait 3 more weeks to sand & buff again. 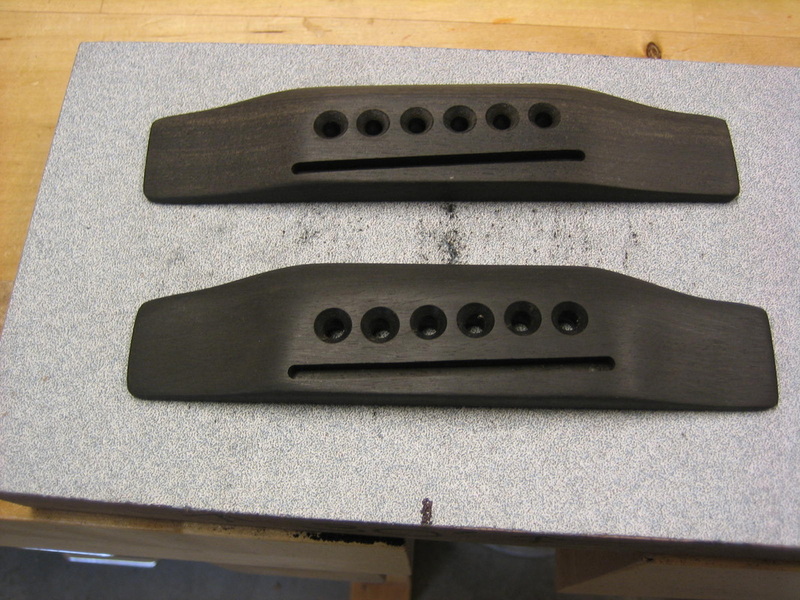 In the meantime I keep busy with the bridge & pickguard. 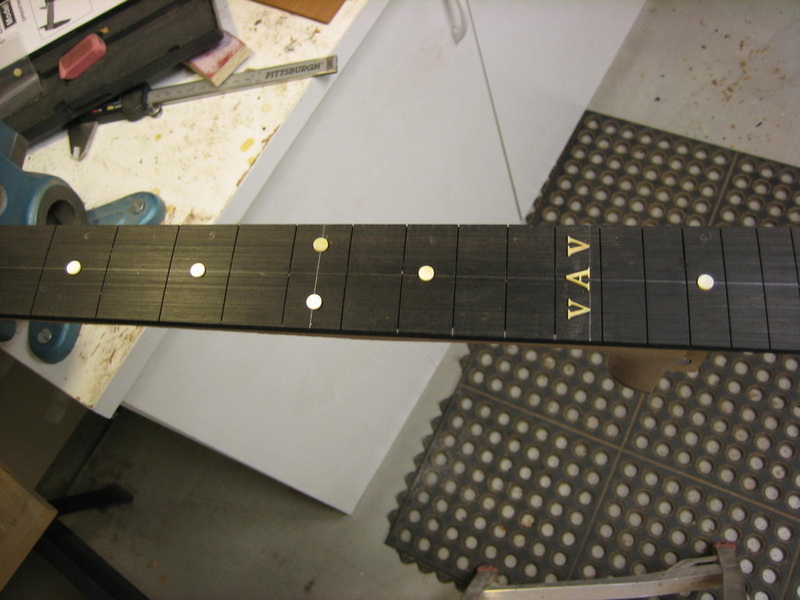 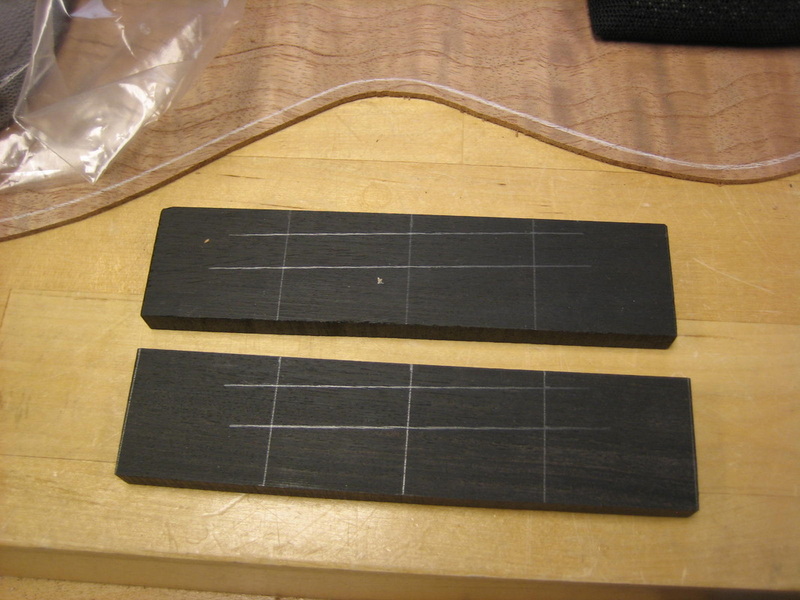 Pictures below, starting with a piece of ebony dimensioned and marked with saddle and bridge pin location. 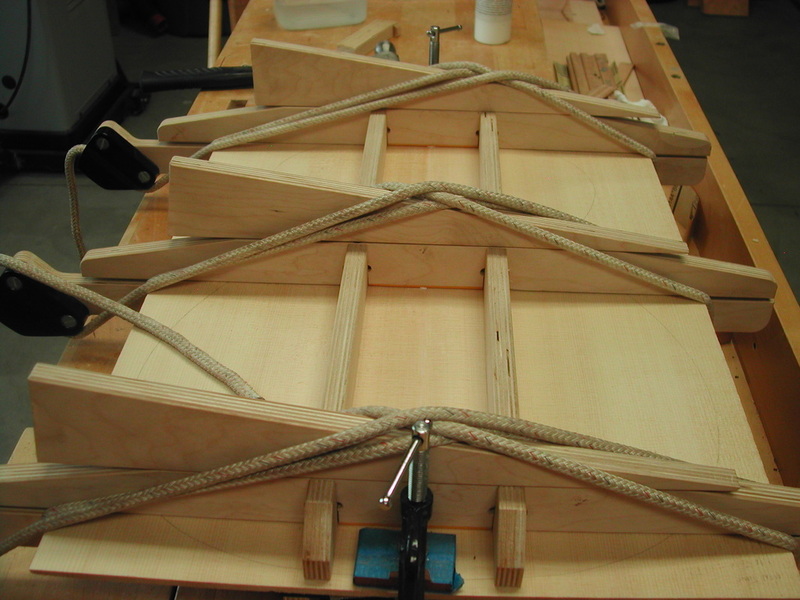 Two bridges to choose from. 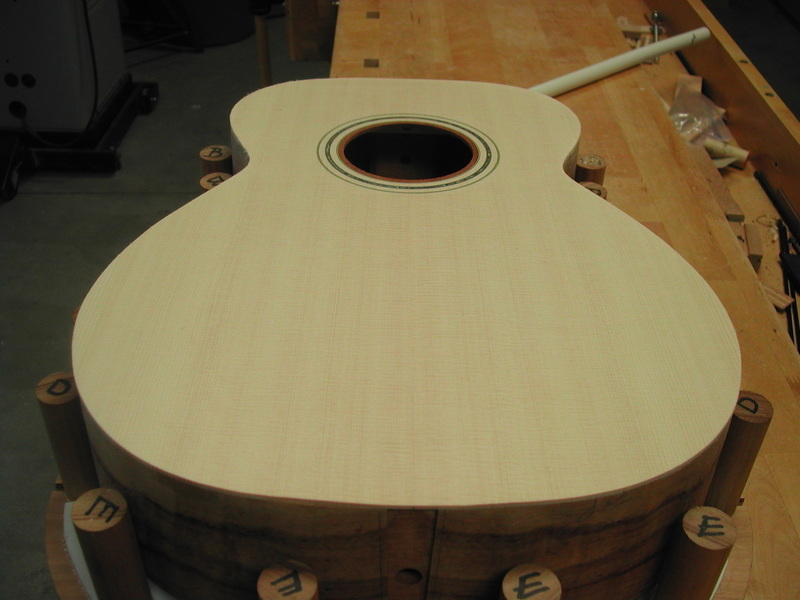 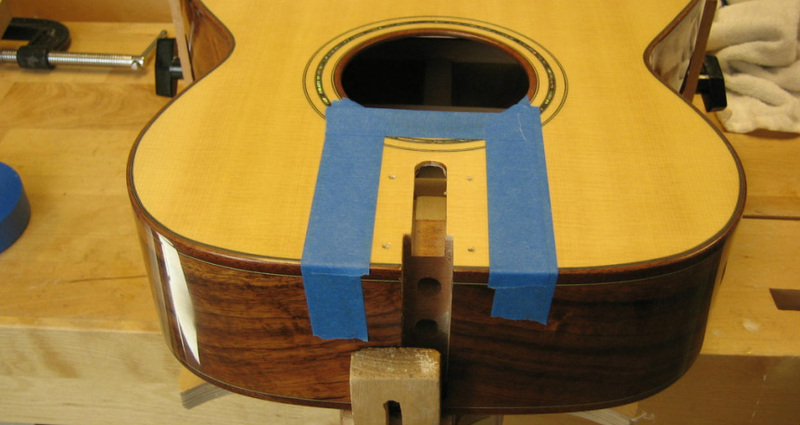 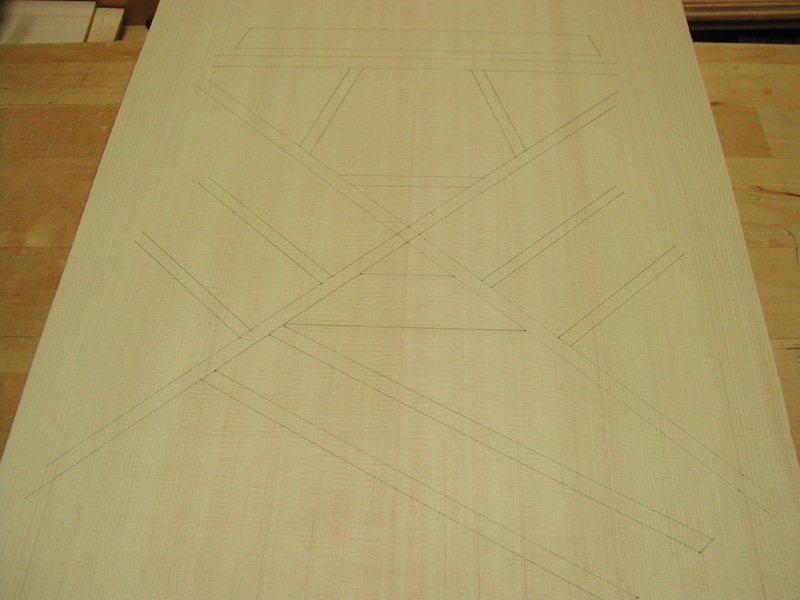 The bottom will be sanded on the buffed-out guitar top so that the bridge will fit the top very closely.